BANGI, 16 Jan 2014 – The Faculty of Science and Technology (FST) was judged as the best group in the procession during the Maulidur Rasul celebrations at The National University of Malaysia (UKM) here today. It was led by Mohammad Walid Osman. The procession was launched by Vice Chancellor Prof Datuk Dr Noor Azlan Ghazali who also joined in the procession in commemoration of the birthday of the Prophet Mohamad. The march started from the Arts Theatre passing through the Faculty of Social Science and Humanities, through to the Ungku Omar Residential College, the UKM Health Centre and ending at the UKM Mosque. Prof Noor Azlan also launched a new Zakat counter at the mosque. He also gave away prizes to the five best group in the procession. The UKM Health Centre led by Osman Ahmad was second with the Department of Student Services and Residential Colleges led by Dr. Roslan Jalil coming in third. Fourth was the Development and Maintenance Department led by Haji Suhaimi Hassan with the Faculty of Economics’ Graduate School of Business led by Prof Dr Nur Ghani Mohammad coming in fifth. 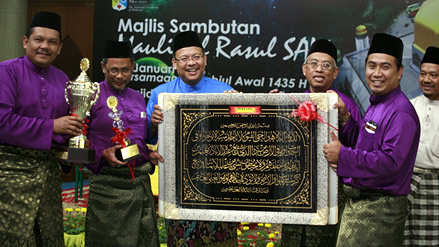 Apart from the procession and the opening of the new Zakat counter, a forum and an exhibition was also held in conjunction with the celebrations.